Asia is forecast to add the highest trunk pipeline length to the global petroleum products pipelines industry between 2018 and 2022, contributing a total length of 15,355 km by 2022, which will account for around 49% of the global planned petroleum products pipeline length additions, according to leading data and analytics company GlobalData. The company's report: ‘Global Petroleum Products Pipelines Industry Outlook to 2022' forecasts that around 30,840 kilometers (km) of planned petroleum products pipeline length will be added globally by 2022, taking the total global petroleum products pipeline length to around 272,690 km by 2022. Asia also has the highest new build capital expenditure (capex) spending globally with around US$5.8bn during the 2018–2022 period. Among the countries in the region, India will have the longest planned pipeline additions of 9,828 km by 2022. 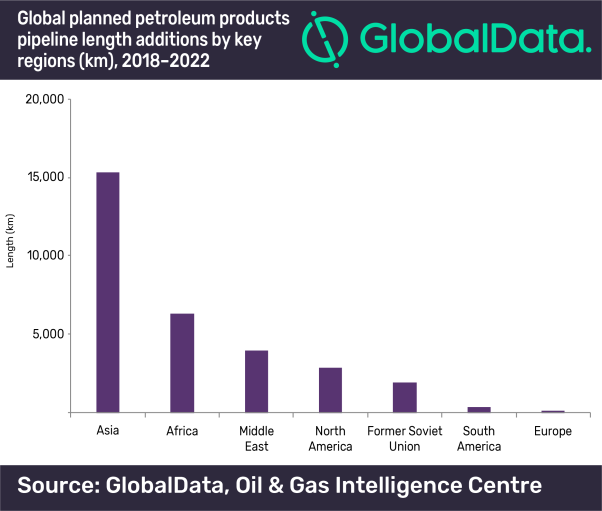 GlobalData identifies Africa as the second highest in terms of pipeline length additions as well as the second highest for spending on planned pipelines in the global petroleum products pipelines industry. The region has planned investment of around US$5.6bn by 2022 and plans to add a total length of 6,283 km of petroleum products pipelines by 2022. Congo Republic will be the top country in the region with a planned petroleum products pipeline addition of 1,200 km during the outlook period 2018 to 2022. The Middle East is the third highest among the global regions, in terms of petroleum products pipeline length additions. The region is expected to add around 3,950 km of planned petroleum products pipelines between 2018 and 2022. Among the countries in the Middle East, Iran will lead with planned length additions of 3,898 km by 2022. The report also states that the three longest planned global petroleum products pipelines in the forecast period are Kandla–Gorakhpur pipeline in India, Kermanshah–Tabriz pipeline in Iran, and Fushun–Jinzhou–Zhengzhou pipeline in China with lengths of 1,987 km, 1,766 km and 1,636 km respectively.